Even before the grand, gold curtains of the Geary Theatre open, sounds of an ocean’s waves permeate around us, punctuated by the cries of sea gulls overhead. 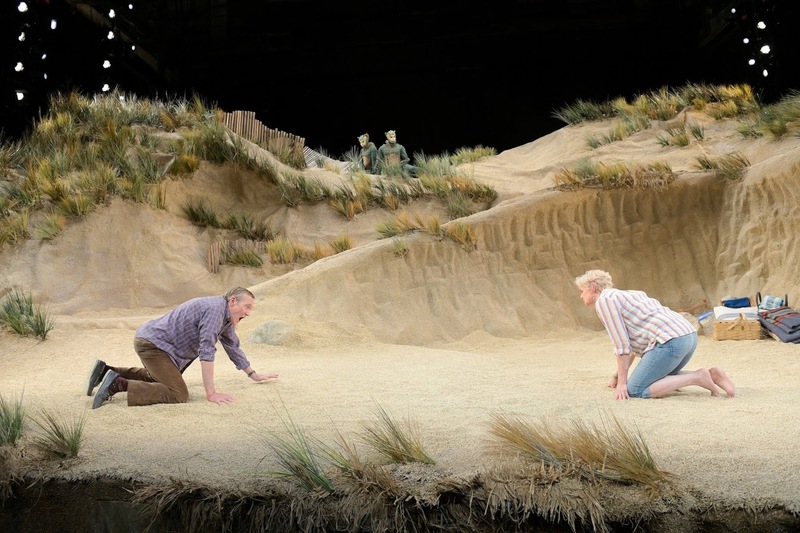 A beach and its sea grass spills into the laps of the first row of audience members – a beach that grows into layers of high dunes once the curtain rises. Yet as we watch a woman painting at her easel on a sandy path above a man reclining on the beach, how can we not notice that David Zinn’s beautiful seaside has no blue sky, but only the black and stone back walls of the Geary? Where there should be sun and clouds, there are side-stage and overhead layers of glaring stage lights. What is real and what is not is already raised as a question as an Edward Albee play returns to American Conservatory Theater after a ten-year hiatus, tonight directed by the new Artistic Director and Albee expert, Pam MacKinnon. What is to follow is a fully funny, intriguingly beguiling, and in the end, surprisingly optimistic Seascape, Edward Albee’s 1975 play, second-of-three winners of the Pulitzer Prize for Drama. Nancy grabs the picture she is painting (one that shows the blue sky and ocean’s waves that we do not see) and literally skips, jumps, and hops down to a statuesque husband who barely moves a muscle. She babbles almost without taking a breath with kid-like enthusiasm about her love for beaches and proposes that they become “seaside nomads,” wandering the world, beach to beach. The more Ellen McLaughlin’s Nancy conjures her proposal for their newly retired lives, the more her hands flail in spread-finger excitement, with her whole face glowing as scenes of sand and sea clearly form in her head. For the next half hour or so, the two continue this dance where Nancy tries to lead Charlie in steps he shows no interest in taking. She recalls stories he has told during their thirty years of marriage about his boyhood desire to live under the sea, and he wistfully remembers how he would once sink to water’s bottom (even 20-30 feet) with heavy rocks on his chest, waiting for initially frightened fish ready to nibble his toes. However, when Nancy bursts with encouraging suggestions that he get in touch with his youth and sink in the water again -- right here, right now – Charlie becomes embarrassed, agitated, and eventually darkly sullen. Charlie is content to remember the past and to relax in the present, rewarding now a life well-lived with well-deserved rest. Nancy, on the other hand, wants nothing of that, leading to a huge, shout-filled argument about the difference between their “having had” a good life together and their currently “having” a good like together. Occasionally interrupting their haggling conversations is an overhead roar and a beach-enveloping shadow as low-flying jets traverse the entire Geary Theatre, with each time Charlie warning some variation of “They’re going to crash into the dunes some day.” The powerful interplay of sound and light created by Brendan Aanes (sound design) and Isabella Byrd (lighting design) is indeed a bit unsettling and is one way of symbolizing a central question of the play, to what extent is evolution and change progress or not. Just as their up-and-down arguments come to a pause (arguments which include a testy -- but also funny, for us -- sidetrack into an admission by Nancy of one week many years prior when she thought of divorcing Charlie), visitors suddenly appear above on a high dune. But these are not folks in typical beachwear; they are not even folks at all. Walking cautiously but ever steadily forward on two of their four legs are two, gigantic lizards – lizards in their green, scaly grandeur with fascinating, yellow faces and tremendously long, trailing tails (thanks to the creative costume designing of David Zinn). And as we might now expect, Nancy is immediately intrigued and ready to approach them while Charlie is frightened to his most-cautious core. With feet and hands frozen in the air as they lie on their backs, the two try ‘playing dead’ while smiling toothy grins (his terrified, hers more friendly and inviting). In the meantime, the taller of the two lizards approaches and pokes cautiously each, taking time to grab a quick sniff. And thus closes and opens Acts One and Two, with the audience howling its approval when they see Nancy and Charlie still on their backs with silly grins as the curtains rise after intermission. What ensues is a step-by-step (often three forward, two back) process of two species totally foreign to each other sizing up the other two and slowly getting to feel slightly more comfortable interacting. The English-speaking lizards – a couple named Leslie (Seann Gallagher) and Sarah (Sarah Nina Hayon) – in many ways mirror their human counterparts, especially in the ways both Nancy and Sarah immediately begin to bond and to show increasing fascination and empathy for each other and the ways Charlie and Leslie are much more standoffish, cautious, defensive, and even belligerent. What follows is a series of encounters where each pair is confronting “the other,” with bouts of impatience, misunderstanding, and flared anger (mostly coming from the males) intermingled with defining, sharing, and explaining words, physical objects, and experiences foreign to the other (mostly as led by the female halves). From birds and planes to emotions to differing body parts, the topics to explore pour forth. The more they interact, the more the lizards surprise with their human-like responses and reactions; but also the more the humans sometimes react in ways quite beastly and insensitive. But as they continue their getting-to-know, they raise for us questions important to contemplate about our own projections of how we want to spend our futures, about what is progress and what is not, about how to approach moments of life’s true transitions, and about the very nature of what it means to love a partner for maybe a lifetime. What is rare for many of Albee’s plays, in his Seascape there is an upward trend of the conversations toward outcome that shows hope for the future. How he and Director Pam MacKinnon get there is fun to watch, with the total of two hours (with intermission) passing with nary a minute of wasted dialogue or wandering audience attention. 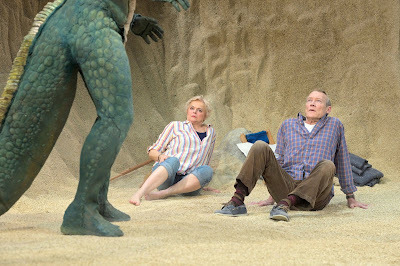 Clearly the director knows her Albee well (this being her eleventh of his plays to direct), with her grasping how to make the script’s strange interactions between humans and lizards as natural, charming, and enlightening as any two couples who have obvious differences but also soon reveal many, hidden similarities. 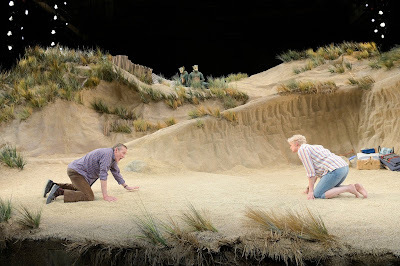 The result for us as an audience is an unexpected adventure via Edward Albee by the seaside of Seascape at the American Conservatory Theater that is pleasantly enjoyable, surprisingly different, and intriguingly thought-provoking. 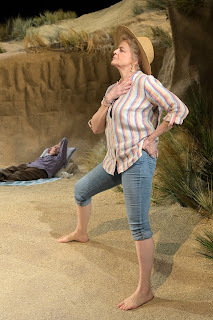 Seascape continues through February 17, 2019 at American Conservatory Theatre, 405 Geary Street, San Francisco. 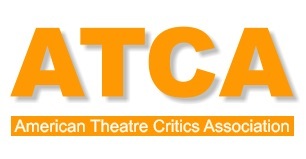 Tickets are available online at http://www.act-sf.org/ or by calling the box office 415-749-2228.